In 1681, King Charles II handed over a large piece of his American land holdings to William Penn to satisfy a debt the king owed to Penn's father. The King granted to Penn an extraordinarily generous charter which made Penn the world's largest private (non-royal) landowner, with over 45,000 square miles and sovereign ruler of the territory with all rights and privileges, except the power to declare war. William Penn called his territory "Sylvania", Latin for "forests" or "woods", which King Charles changed to "Pennsylvania" in honor of the elder Penn. 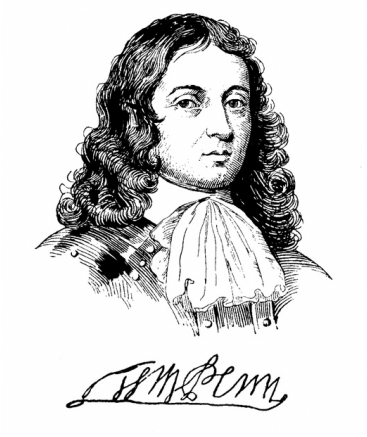 William Penn labored to create a "Framework of Government" Pennsylvania's first constitution, setting forth the democratic principles that served as an inspiration for the United States Constitution. As a pacifist Quaker, Penn had suffered himself from religious persecution. He knew first hand the problems of religious intolerance and the problems of war and peace. He developed a forward-looking project for a United States of Europe through the creation of a European Assembly made of deputies that could discuss and adjudicate controversies peacefully. Penn's design was to create a political utopia guaranteeing free and fair trial by jury, freedom of religion, freedom from unjust imprisonment and free elections. Huguenots and Jews from France, Germany, England, Holland, Sweden, Finland, Ireland, and Wales.